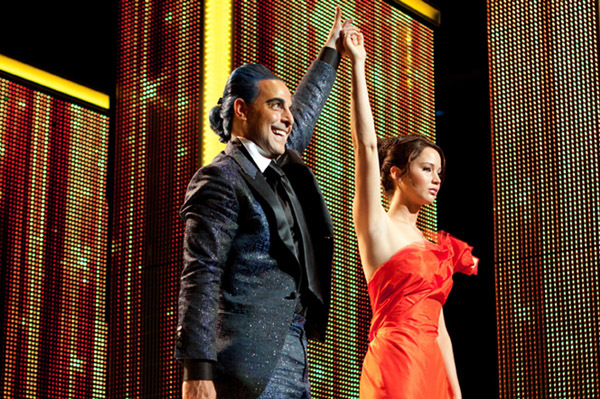 Katniss Everdeen makes her first big splash in the Capitol when her stylist, Cinna, lights her on fire. We love the idea of fire fashion, but then there’s that whole pesky safety issue. No matter — we managed to find plenty of fire-inspired pieces that you can incorporate into your wardrobe (and make Katniss proud)! The Hunger Games author Suzanne Collins must have been psychic or something when she wrote the books. 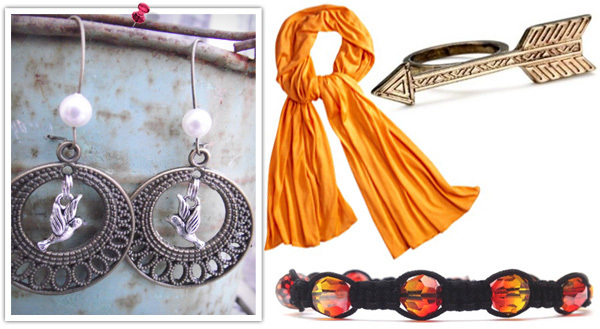 Color is huge this spring, making fire-inspired fashion on-trend. We automatically think of dresses when it comes to Katniss since she wore the famous fire dress when she arrived in the Capitol, though the wide variety of skirts and pants in fire red and oranges can help you build a look worthy of The Hunger Games. As far as dresses, this Willow Print-Plunge maxi dress is almost exactly how we’d design Katniss’ Capitol fire dress, though the price tag is a little steep at $895. On the other end of the spectrum, this taffeta dress from U.K. fashion website NextEve.com looks a lot like the movie’s version of Katniss’ dress — and it’s more affordable at $150. 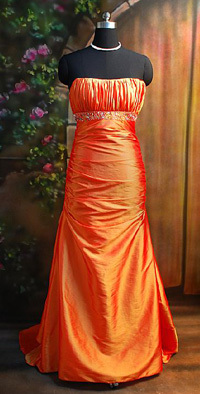 We also love the ombre look of this Studio 17 dress ($278)– it looks exactly like flames with its reds and oranges. If skirts are more your thing, check out this asymmetrical wrap skirt found on Polyvore ($47) or this loose bold flame skirt from ModCloth ($43). As for pants? 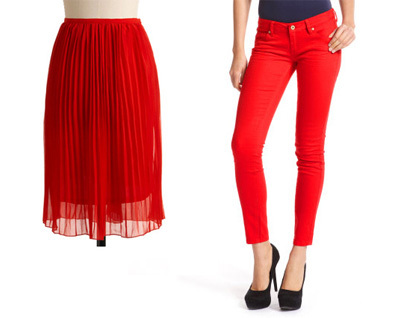 We’re loving these fire red skinny jeans from Charlotte Russe for a budget-friendly $30! Put some fire on your feet with some orange and red heels and flats. 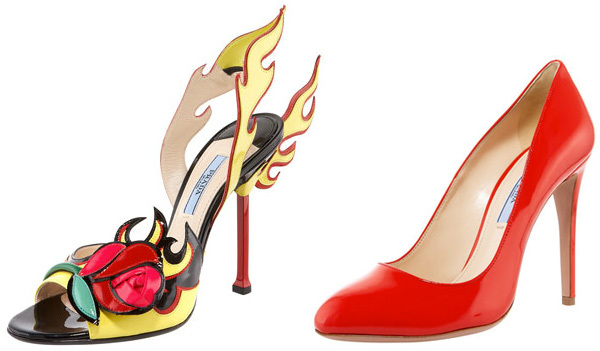 These Prada heels ($1,300) are more literal on the fire trend than we would have expected, but we’re sure some fashionistas can rock these with style. Luckily, the Italian fashion house also sells these adorable patent pumps in red — pair these with some dark jeans for an eye-catching look. Oh, they’re also more affordable at $620. Don’t worry, flat lovers — we’re pretty sure Katniss would prefer these orange Tory Burch Reva ballerina flats (they even kind of look like they belong in The Hunger Games, thanks to Burch’s signature buckle). We’re also loving these Kate Spade New York flats with just a touch of orange. Um, how cool is this arrow ring from House of Harlow 1960? It’s like Nicole Richie and her gang of fashion designers knew that this would be something Katniss would love. We also have to have this — it’s expensive, but not too expensive at $113. Also, what about Mockingjays? The bird is a symbol throughout the trilogy, but we don’t want to wear one of those cheapo souvenirs that companies are making to cash in on the film’s popularity. We found these Mockingjay earrings ($16) on Etsy that are totally adorable (and appropriate) for a Hunger Games-inspired outfit. Also, we found this bracelet on Etsy ($25) that looks like it’s inspired by the movie. It would totally look cute with a black dress, don’t you think? Also, no fire-inspired outfit is complete without a fire orange scarf like this Mossimo one from Target ($15). What are your favorite pieces inspired by Katniss’ fire dress in The Hunger Games?